I’ve been a little quiet on the blogging front. Mostly because I have been living at The Brewery running the recycled Christmas craft workshops. It’s easy to say, but I was genuinely overwhelmed by the number of people who came along and the positive response we had- over 300 people in total which is far more than I was expecting. A wonderful group of people came and helped set up, welcomed visitors, made snowflakes and shared crafts. Thank you! Tue 17 Dec, 6-9pm grown ups only. Any help publicising these would be very much appreciated as it’s been a non-stop scramble and labour of love to get it all ready! Creating our first public event, incorporating the company and invites to the ideas meeting. 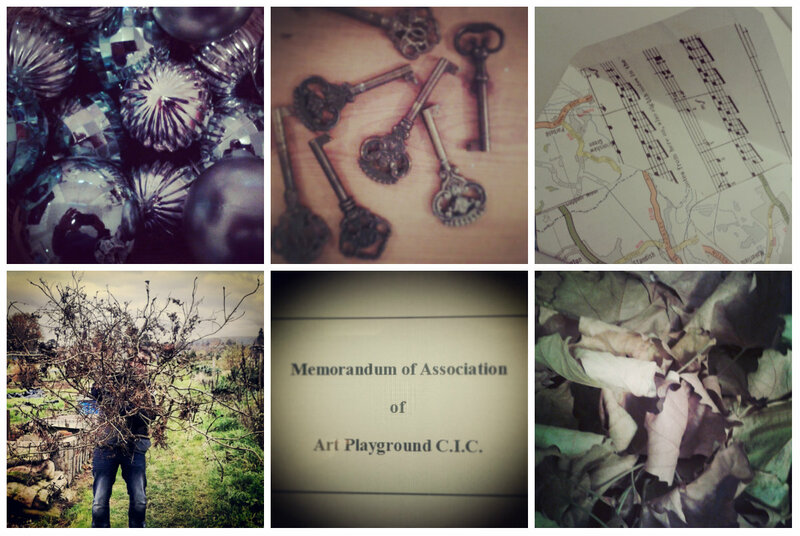 Art Playground is coming to town. Far sooner than we had anticipated! We were going about our usual business; incorporating the company, sending out invites to the ideas meeting (this Tuesday- hope to see you there), when an exciting opportunity flew out of the sky. Well not quite. I had a meeting with The Brewery to discuss the idea of a pop-up event at Easter- a small scale version of the Art Playground, just to test the water and see what the response was like. The brilliant staff at The Brewery were enthusiastic and asked if we could start tomorrow. I laughed thinking they were joking. They weren’t. 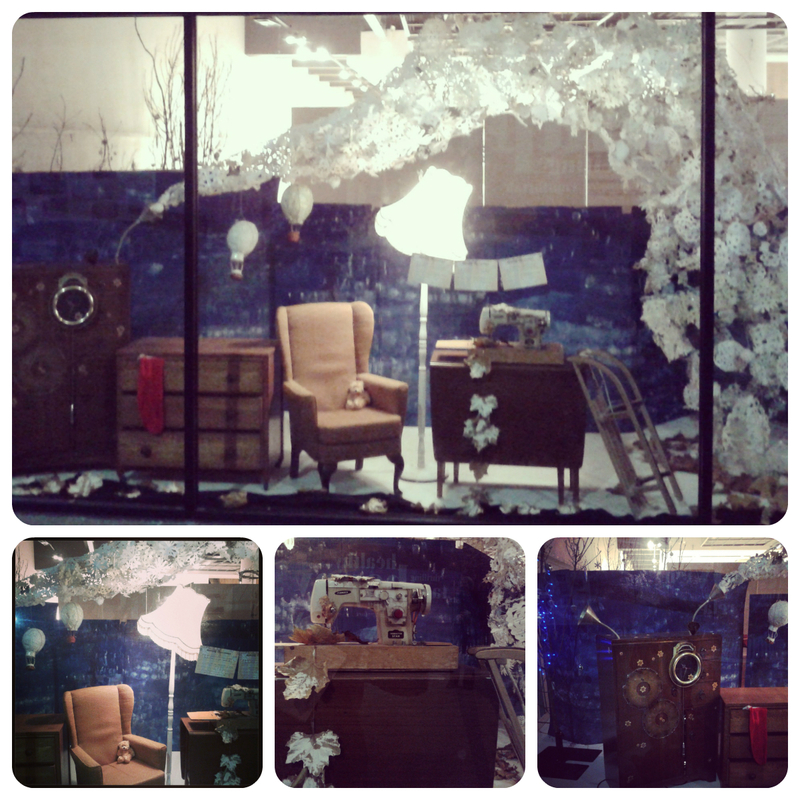 A Christmas workshop like no other. Little elves and grown up elves alike are welcome. 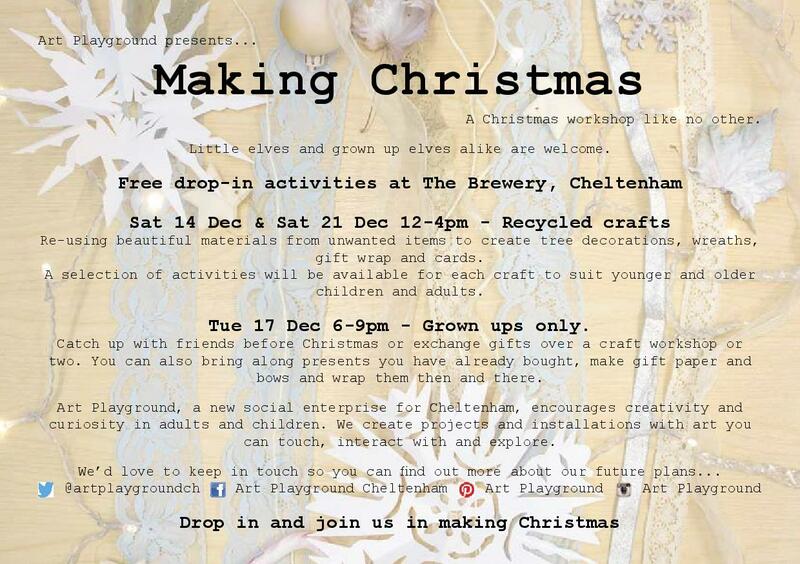 Re-using beautiful materials from unwanted items to create tree decorations, wreaths, gift wrap and cards. Grown ups only. Catch up with friends before Christmas and exchange gifts over a craft activity or two. It would be brilliant to see you there. Before we even get to that though, this Tuesday, 3rd December, is our first open meeting to share plans so far, see what you think and chat through possibilities. Again adults and children alike welcome. It’s a drop in event so pop along any time between 4.30 and 8pm. Full details here. I’m off to make a hot air balloon out of an old map.